So I’ve been playing LoTRO again, on Anor, one of the new Legendary Servers. I ran out of gas with two new characters on Landroval, largely because the early zones are sparse, but restarting on Anor has been a lot of fun since there are so many players around now. When the server opened I delayed going to work just to create characters with the names I wanted. Yep, silly but on the other hand, not getting a preferred name would irritate me ever so slightly every single time I played. So it was worth it. As a result, I have Hellebore the hobbit guardian. Anyway, I’ve also enjoyed every class I’ve played in LoTRO. Which leads to the funny situation of why I’m playing a guardian again – which was my “main” and highest level char on Landroval. The first char I considered my main was a hunter, and after easing into the game I tried out several others for variety. That led me to the lore-master, my main until somewhere in the 60’s. As I recall, somewhere in Mirkwood, I accidentally deconstructed the wrong legendary item (staff) and kind of screwed myself since the others ones I had were bad. I was bummed and decided to take a break from the LM, giving myself time to get over it (the reality is this error wasn’t terminal, I could always get another LI and level it up, and so it really only set me back a few weeks, tops. But at the time it really stung; I figured I’d play another character for a bit to ease the pain). That other character I took up was… my guardian who was the last of my original 5 chars to go through Moria. I wound up really getting into the guardian and played that char, alting on my burglar for variety. Flash forward to Anor, starting with a hobbit minstrel. Things were going well until level 17 when I was overwhelmed by some bandits and suffered my first defeat, thus denying that character the level 20 survival title. Again, not the end of the world but I figured I’d take a break… and played my guardian who has now taken over lol. Basically, because I enjoy every class (captain and beorning are the two I have the least experience with), these kinds of “take a break to play the alt” run the risk of finding a new main! So Hellebore the guardian is now level 28ish, wrapped up the Lone Lands and is off to Esteldin to continue the Vol 1 Book 3 quest line. Along the way I grabbed some screenshots of Weathertop. Questing around in Far Chetwood. I joined a kinship, the Council of the North, because they advertised the desire to do 3/6/12 man content. That’s what I want to do! After a bit of questing in Evendim, Spessartina reached level 37 which is the suggested level for starting Vol 1 Book 4: Chasing Shadows. So I bailed out of Ost Forod to Bree and then to Ost Guruth and across the Last Bridge into the Trollshaws! Since I’ve done the SoA content a few time I’ll just quest as needed to keep level with the storyline and at all time prefer advancing in the storyline. It’ll be a ways until I replace my guardian Naerys with my new minstrel Spessartina but I’ll enjoy the journey. One thing I like about LoTRO is how many player activities are always going on in Bree. One some random evening there may be a concert outside the Prancing Pony. I always stop and watch for a few minutes, dancing my favorite dance (Hobbit Dance 1). Anyway, I stopped at the skirmish camp south of Bree to upgrade my gear to level 37 items, and then on to Thorenhad. Fall colors view from Thorenhad. After finishing up Vol 1 Book 1 on Spessartina, I headed east of Bree to the Lone-lands. It had been a very long time since I quested through and was pleasantly surprised at the reorganization. The Forsaken Inn was jam packed with quest givers to start you out, but one or two other Eglain camps spaced out to the east helped lead to Ost Guruth. Lone-lands is both familiar to me and fun, however at the same time I’ve gone through enough so I beelined Book 2 in order to head to Esteldin in the North Downs. I just had to lend a hand to Radagast the Brown first. He didn’t fight too much during the Red-Pass instance, but in the end he did call down a lightning strike to drive Ivar away. Spessartina reached level 30 and I decided to reorganize a bit. First, I settled on Virtues to work on: Innocence, Tolerance, Charity, Honour, Patience. I’m a fan of mitigation/resistance virtues over straight stat buffs, and this collection represents, as the primary effect, physical mitigation, tactical mitigation, resistance (x2) and ICPR (in-combat power regeneration). I need just a few more quests, kill deeds, and exploration to get them all into the 2-3 range. Second, I respeced to Warrior-Skald. I had been playing as a Watcher of Resolve, but many fights were dicey. For example, when I had to collect sigils of the gaunt-men, who are signature mobs with an add usually standing right next to them. Oh, the gaunt-men can also summon. So many times I was briefly fighting 3 enemies at once. My strategy there was simple: fear one away (Invocation of Elbereth) and then immediately try to kill the gaunt-man before he summoned another. My morale dipped under 33% many times and I decided that going forward I would spec fully into Warrior-Skald, the minstrel DPS spec. Why not, LoTRO makes it pretty easy to have 2 specs and switch between them. Third, I was looking for a diversion and went to a skirmish camp. I find these fun in small doses, so I’ll do some later. Maybe I’ll even make a point of doing a skirmish every time I play as a way to break up the quest/leveling process. What I hadn’t noticed before was the great gear you can get by trading in marks! Back when I was leveling my original group of characters, my “main” was a hunter about 5-10 levels higher then my next highest character. My hunter, Glyneth, is an explorer and provided hides, ore, and wood for my other character’s crafting until they got far enough along to do it themselves. I don’t get enough hides to tailor armor for two characters, but now I don’t have to farm for materials thanks to skirmish gear – I can get jewelry, and weapons too! This is awesome!! I was lucky that that summer festival had an encore, or I’d have to wait until the next festival to get these two enhancements. Pie-Eating Champion is the title I wear the most on Naerys, who is adventuring outside Minas Tirith, so I want to get it for Spessartina and Scarlatina. The title comes from doing a quest from Humbert Sandweaver in the Bree Festival Grounds. Unfortunately he only runs the contest 1 of every 3 days. I checked in and was bummed the contest wasn’t running. Oh well, there is other festival stuff to do. Something I hadn’t tried before was kite-flying, so I accepted that quest and quickly ran around the Party Tree to finish it off. In real life, I hate mushrooms. So this field that I never noticed before is horrifying. So I have two hobbits in the Shire, my new minstrel and warden. I decided to quest leisurely with my minstrel Spessartina, and beeline the epic storyline (do storyline quest on-level, local questing otherwise) on my warden Scarlatina. I do want to get the Innocence virtue that comes from doing 75 quests in the Shire, but also only take one char through the Shire at a time. I decided the warden makes a better candidate for pushing a bit since they are fairly sturdy (medium armor, shields, lots of self-buffs) and I mostly expect to solo on her. The warden has some of the most unique mechanics I’ve seen in an MMO. They have three “gambit-builder” skills: Spear, Shield, First, a.k.a. Red, Green, Blue (for the color associated with the skill), a.k.a 1-2-3 (for the hotkeys that 99% of everything about wardens assume you have bound to each skills). Using these skills as building blocks, wardens build more advanced skills, gambits, based on various patterns of the gambit-builders. Here’s a list from Lotro wik. 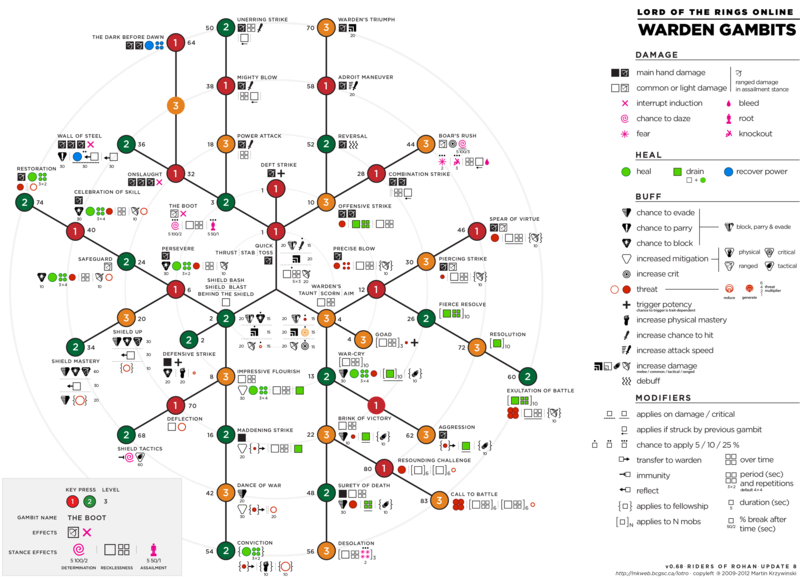 Another visualization of warden skills is the complicated looking gambit chart from Martin Krzywinski (just follow the colors/numbers from the center). This skill system takes a little getting used to, but is the kind of challenge I’m looking for: deciding what skill to use to get the effect I want, build it up and then execute it. It takes a bit of planning ahead since forming a gambit takes multiple gambit-builder skills. You can’t just hammer each skill on cooldown and expect to survive. Meanwhile my minstrel actually finished the prologue up first. However, Spessartina is headed back to the Shire to quest a bit more. I also thought about what to do about the Aria of the Valar I have on my first account. Naerys is level 100 and outside Minas Tirith, so the buff is mostly wasted on her. I intend to play Spessartina through the storyline – I’ve done Shadows of Angmar and Mines of Moria multiple times (!) but it’s also been a while since the last time. My warden Scarlatina is on the other account. So I think the beneficiary of the buff will be my burglar Dhrun. Burglars are fun to play, mine is level 82-ish and somewhere in Rohan, so not too close and not too far from level 105. I’ll think about it more. The only other choices on that account are hunter and lore-master. With some new-founded motivation I started LoTRO, my goal was to create 2 characters and play them a bit. In reality, the evening bogged down with the minor housekeeping that MMOs impose. First up, creating characters. That doesn’t take much time in general, except for the dreaded naming issue – I want a decent name, something that fits, but the problem is so do all the other players. As a result, I spent 30 – 45 minutes trying to come up with names that weren’t already taken. Sigh. It’s easier in other games that let you have a first and last name (i.e. a space is allowed to separate names) but LoTRO isn’t one of them. I decided to make my new minstrel and warden both female hobbits, so something lore-appropriate are flower and/or gemstone names. I tried a bunch but most were already taken. Eventually I found spessartine, a gemstone, a name that was already taken. However, modifying the name slightly to Spessartina worked, thus a new minstrel was born! On my other account I tried numerous flower variants, and eventually wound up back at heliconia (I tried that name for my other newbie minstrel but ended up spelling it Heliconya to avoid conflict, so I already knew Heliconia was taken). However, digging deeper I found a Heliconia species name I liked: Scarlatina. It helped that the -tina suffix matches with Spessartina. Thus, another name and a new warden was born! After logging them in, working through the initial mini-tutorial, I decided it would be a good time to catch up with the latest fancy configuration options and install plugins. I used plugins when I played WoW and know that can be very useful, so I dug around for recommendations on good one for LoTRO. I started with the LoTRO Plugin Compendium, which helps install the other plugins, then Buff Bars, Combat Analysis, Minstrel Buff, Palantir 2, Sequence Bars, and Warden Ease. I installed Huge Bags as well, but it seems that functionality is already in the game, I just haven’t been taking advantage of it. Bag 1 has a button that toggles edit/combo mode – rows from other bags can be dragged/combined together. So I logged in Spessartina, Scarlatina, and Naerys, and configured their bags into one giant bag. It didn’t take too long and will improve how I manage inventory. Next up, I had to reposition UI elements. Various game elements were overlapping each other so I straightened that out too… on each character because these settings aren’t shared. Eventually I finished this too. A representative screenshot appears above: I’ve moved various windows around so they don’t overlap as much. What I didn’t have energy for was sorting inventory items, I just dragged them all to the end of the bag (also seen in the screenshot above). How does a brand new character have 35+ items already, you ask? Well all that stuff in my bags are goodies from various preorders (cosmetic armor sets, mounts), anniversary gift boxes, and so forth. I’d move it into an available vault space but I can’t! I’m still in the tutorial, secondary phase, so I don’t have vault access yet. I also don’t have the riding skill so I can’t add the mounts to my skills yet. To sum up: I played for ~2 hours and didn’t get that much gameplay. I started 2 characters, spent a long time coming with names, got them out of the initial tutorial, installed plugins, rearranged my UI, amd consolidated bag space. I wanted to have some action so I started Vol 4 Book 5 on Naerys by speaking with Mithrandir in Minas Tirith, and quested along to the Vol 4 Book 5 Chapter 4 in the village of Drû Bhûta. Off like a herd of turtles! In TSW I played a Dragon character, so this time I rolled up an Illuminati and a Templar to see if I like those factions better – granted there are minimal differences. My reasoning was that this is my favorite MMO. I haven’t played much lately, and I’ve taken breaks, but I’ve always come back and really enjoyed the pacing, setting, and storyline. When my kin was active I also grouped and really enjoyed it. How can I not get the expansion?! Since my guardian Naerys is only level 100 and a few books behind in the storyline, my goal is to beeline the epic quests and enter Mordor. At least just a little bit. I haven’t decided what to do about the character boost. I’d prefer a character that can heal should I join the occasional group, rather than tank (requires too much knowledge of the encounter) with Naerys, so that means Runekeeper, Minstrel, or Beorning. Of those, I have a low 60’s minstrel parked at Caras Galadhon. I could boost her up, but I’m thinking of rolling a new minstrel and boosting that character instead. Why? Well, my existing minstrel is an elf and that’s fine, but I like hobbits and would rather have a hobbit minstrel. All else being equal, hobbits have 2 useful race abilities: stealth and silence, whereas elves have their own stealth and grace. I don’t remember Eldar’s Grace ever saving my bacon but Hobbit Silence has plenty of times. Minstrels get their own feign death skill, so a hobbit minstrel has two emergency skills which is very compelling to me. Over on my other account my hobbit minstrel is level 20 and in the North Downs. What I plan to do there is roll a hobbit warden.The warden is so unique as far as how they play I gotta give it another whirl, and pecking away at leveling through the content would be a great way to relearn the warden gambit system. My existing elf warden is also in the low 60’s parked at Caras Galadhon, but is on my first account. I’ll make better use of my store points if I play a character on each account rather, so the plan is a few months down the road, I’ll have a boosted hobbit minstrel on my first account, and a hobbit warden on my second account that I intend to play through the storyline normally. On the other hand I also really enjoyed playing my burglar (who is level 82 in Harwick, only my 2nd character to move past Mirkwood) but is on my first account as well. Perhaps when I do buy Mordor for my second account I’ll boost a burglar there if my warden bogs down! So this is where it gets tricky. I have super nostalgia for GW1, but that’s a different game. GW2 never fully clicked with me. The evidence is that 5 years after GW2 released, I have yet to complete a storyline or season on any character! I’ve gone into Heart of Thorns just enough to get minimal gliding on a few chars, and that’s it. So, a purely logical analysis says that I should NOT get Path of Fire, or at the very least, not until I finish a storyline (or more) on at least one character, which will be my ranger or mesmer. Both elite specs look fun to play and are useful support roles. Both are level 80 and both have an ascended trinket collection thanks to me logging in most every day, even if I didn’t play beyond that, and collecting laurels. Should GW2 not take again, I need to put it aside and try 2 games I have that deserve attention as well: DDO and ESO. To this end I’ve decked out my mesmer and am venturing south of Lion’s Arch to advance the storyline.